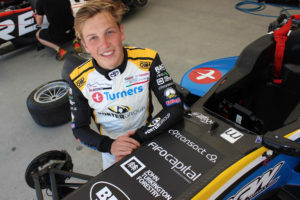 Liam is currently competing in the 2019 Toyota Racing Series (TRS) with M2 Competition. The first of five rounds was held early January, where he placed 1st, 5th, and 1st in its three races. For a TRS rookie competing against far more experienced professional drivers, this was a truly amazing result. More impressively, his current success comes hard on the heels of a highly decorated racing season in 2018 and 2017. In 2018, Liam took multiple podiums and race wins at the ADAC German F4 Championship, and ending the series as the runner up. In the Asian Formula 3 Championship, he won all three races in a clean sweep. A year earlier in 2017, at the age of just 14, Liam finished second in the CAMS Jayco Australia Formula 4 Championship, after becoming the world’s youngest ever Formula 4 Champion. In keeping with this, we can be sure that we’ll continue to see Liam’s talent grow, and Fifo Capital is proud to support him along his journey in establishing himself as a world class racing champion. I’d like to talk about sponsorship, and how it can be a great thing to put in place for the right cause or something that is close to your heart — to give back and help people out. Most sponsors in today’s age are all about what they can get out of the deal. But for us, it’s all about helping a young guy achieve his goals and chase his dreams. We encourage other companies to support people in need too. It is a hugely rewarding experience — it just feels good. This is what Fifo is doing. It’s not about leveraging Liam’s success for our business at all but helping him get ahead and succeed. Currently, Fifo Capital’s financial support helps Liam to continue his racing pursuit in return for Fifo Capital branding on his car and race suit. We don’t expect new business from this – it is about giving a good kid and his family a helping hand. Fifo Capital was the first party to become a sponsor for Liam. Leading motorsport manufacturers have expressed an interest in working with him, and we expect soon one will offer him a place on their team. As those sponsorship financial levels increase, as we expect they will, we will continue to support him in other ways. In the immediate future, Liam will be continuing to pursue victory in the TRS series. You can follow the remaining TRS race live here: http://liamlawson.nz/live/. Fifo Capital is proud of Liam’s achievements so far, and looks forward to supporting him in the future, however it can. We hope you’ll watch and celebrate with us as Liam continues to grow and break into the highly competitive global racing scene.